New Guardians picks up right where the last issue left off with Kyle Rayner surrounded by members of the Red, Indigo, Violet, and Sinestro Corps. And that’s not even covering all the RINGS. One from each Corps. The other lanterns, intent on killing Rayner, fight Kyle and each other to the death. Saint Walker arrives and manages to help Kyle escape and get to OA where he seeks out Ganthet for advice. Upon entering the Guardians chambers he finds that there’s something rotten on the planet OA. 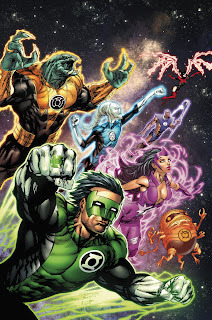 Meanwhile back on Earth the other lanterns have decided to team up and go after him, even though that means breaking the ban that The Guardians seem to have put on their planet. The issue ends with The Guardians attacking Kyle to seize the rings, and interrogate him. Somehow the rings make their way onto Kyle’s fingers and we are treated to a pretty awesome splash page. One thing that I’m starting to wonder about is, what’s Kyle’s motivation in all this. Not the New Guardians, but as a Green Lantern. He tells Saint Walker that he sees Ganthet as a mentor/ father figure, but so far we haven’t really glimpsed much of Kyle’s character. The art by Kirkham continues to be solid, and his respective splash pages are fairly impressive. The aforementioned splash page with Kyle wearing all the rings is ranked up there on my most favorite comic art. The story is getting pretty heavy, and I’m loving it! At the outset I didn’t know what they meant by New Guardians. I’d heard that Rayner was going to be leading a team of Lanterns from each Corps, but it seems like they might be usurping The Guardians! Only time will tell.